When comet 96P appeared in the SOHO's field of view in 2012, we discovered two tiny fragments some distance ahead of the main nucleus. This meant that the comet was still evolving. This time around the comet has added a third fragment (see close up image), once more reinforcing that 96P is very much still an evolving object, and definitely one of the more interesting comets on record. The SOHO team is gearing up for a fifth visit from one of our favorite celestial wanderers! For the fifth time since SOHO launched in 1995, comet 96P/Machholz will be entering the field of view of the LASCO C3 coronagraph instrument. On Oct. 25, 2017, comet 96P will enter the lower-right corner of C3 and skirt up and around the right-hand edge of the field of view, before leaving the field of view on Oct. 30. 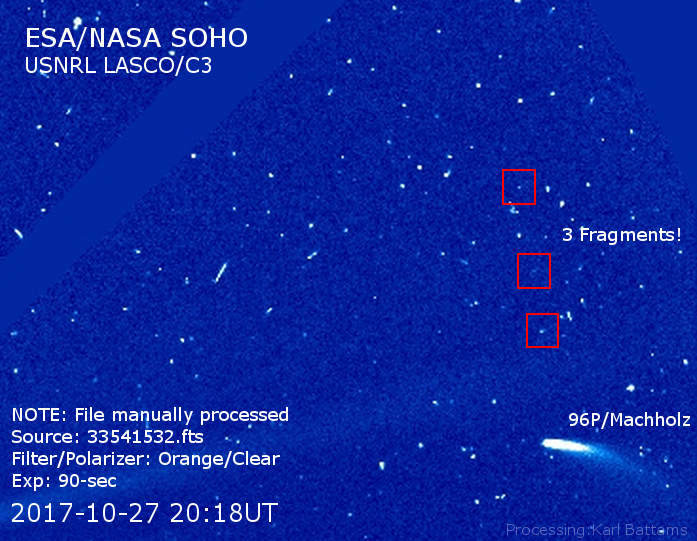 Comet 96P was also visible in SOHO's field of view in 2012, 2007, 2002 and 1996, making it the most frequent cometary visitor to our images. 96P is a fascinating comet. Amateur astronomer Don Machholz discovered the comet in 1986, and it was soon revealed to be short-period, meaning its orbit around the Sun is less than 200 years. Comet 96P completes an orbit every 5.24 years and has its closest approach to the Sun at a rather toasty 0.12 AU (18 million kilometers or 11 million miles). That's very close for a comet, and that alone makes it interesting. But comet 96P has much more to offer! First, it has a family - a big family! Comet 96P is the parent of two separate families of comets (SOHO's "Marsden" and "Kracht" group comets), and the parent of the Daytime Arietid, Southern Delta Aquarids, and the Quadrantid meteor showers that Earth experiences every year. It might even be related to an asteroid. 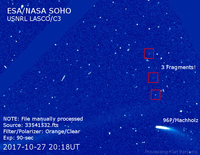 In addition, when comet 96P appeared in the SOHO's field of view in 2012, we discovered two tiny fragments some distance ahead of the main nucleus. This means that the comet is still actively evolving! A scientific study published in 2008 found that comet 96P has "extremely anomalous molecular abundances" -- which basically means it has a really weird composition when compared to all the other comets we know about. 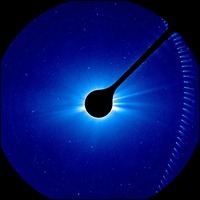 In years past, comet 96P has produced some beautiful images from SOHO's imagers. Its passage in 2002 was perhaps the most stunning so far, with a bonus coronal mass ejection, or CME, erupting just a few hours after the comet passed the Sun. It's worth noting that there was no link between the two -- we sometimes see as many as six more CMEs in a day, so it's no surprise to see a comet at the same time. But nonetheless it makes for a beautiful display! This time around it won't look quite so spectacular, but with an estimated peak magnitude of +2, it will still be very bright. 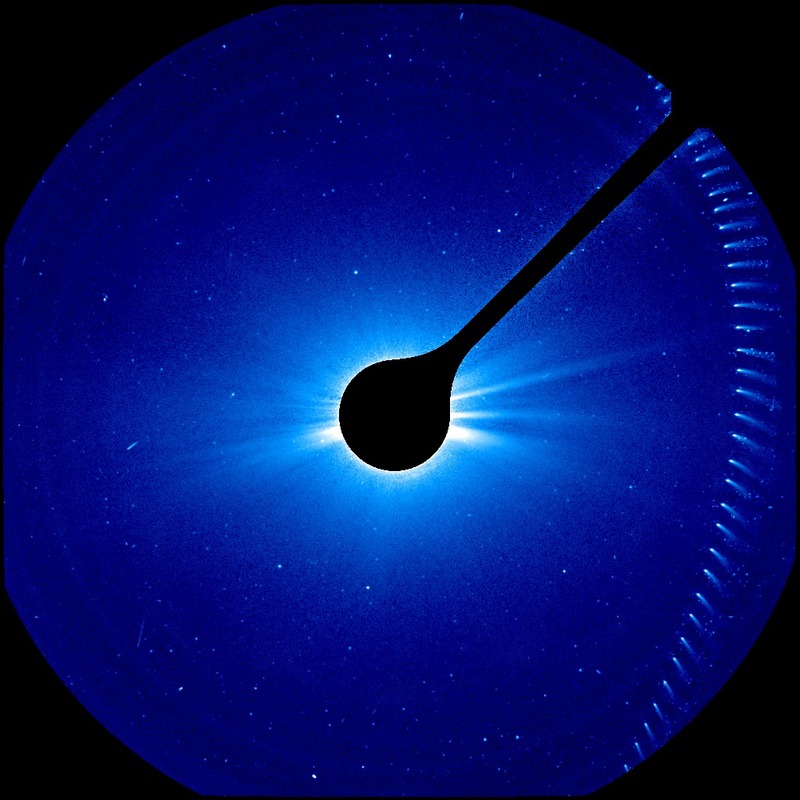 This year, the comet will not only pass through field of view of the SOHO/LASCO coronagraphs, but also through that of the STEREO-A/SECCHI COR1 and COR-2 coronagraphs! 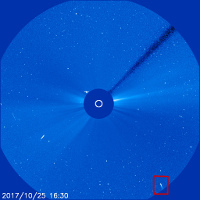 The STEREO-A satellite -- short for Solar and Terrestrial Relations Observatory Ahead -- is currently quite some distance from Earth, but by luck of geometry, the comet will pass directly through the field of view of the camera on Oct. 26-28. For the first time, we will have simultaneous views of comet 96P from two different locations in space. Check back here in the coming two weeks as we update this page with images and movies from the comet's passage. Because STEREO-A is so far from Earth, downlinking data takes a while. However, SOHO -- from its position a mere million miles from Earth -- returns data in, near real-time so you can watch events unfold live on the SOHO website.